What do you do with a left over carcass of a roast chicken? You make chicken soup! Making your own chicken stock from the bones of a chicken is a great way to save money and flavour your food naturally. 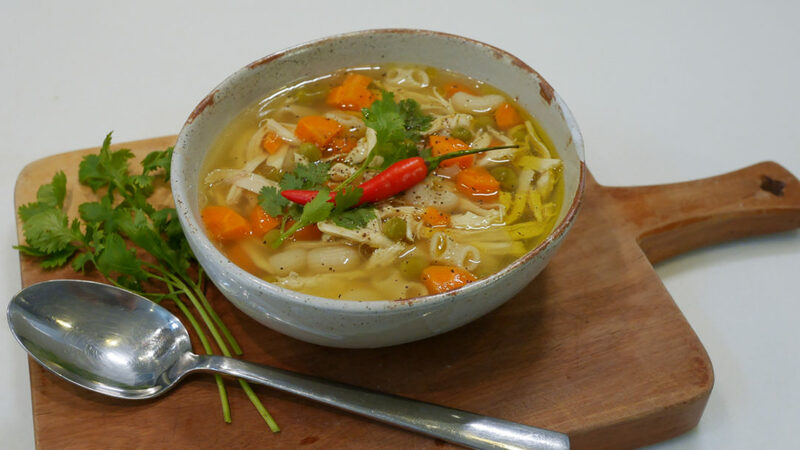 You can use the stock as a base for sauces and soups or use it all for a heart warming dish like chicken noodle soup. You can make it in advance and keep it in the freezer. I sometimes put it in ice cube holders so I can easily control how much stock I want in whatever recipe I’m making. I don’t eat chicken that often anymore but if I had the craving, I would go for organic chicken and something homemade! Pick off the remaining pieces of the chicken from the bones, shred and set aside. Heat olive oil in a large stock pot and add the 2 roughly chopped carrots, celery, onion and garlic and cook until soft and they begin to brown. Add the bay leaf, salt, peppercorns, rosemary and the left over chicken carcass. Pour in the water. Bring to a boil then lower the heat to simmer. Simmer uncovered for 2 – 4 hours. Skim off the surface from the stock every 20 minutes. Remove from heat and strain the stock through a sieve (makes about 3 cups). Cook the pasta according to the label and until al dente then set aside. Add ½ inch cubed carrot to the chicken stock and boil for a few minutes or until soft. Add the peas, elbow pasta and shredded chicken. 10. Serve in a bowl and garnish with fresh cilantro and chili.